I’ve always been amazed by poetry. (Well, once I started understanding it, that is.) I have no ability to write it, at all. For me, words come in sentences and paragraphs, not lines and stanzas; and what’s worse, they come in enormous torrents: I never use just one word when twenty or fifty will do the same job. So when I find a poet, like L.S. Watson, who has a remarkable ability to use one word to say many things, I have to just stop and admire. And in that momentary pause, I hear what she says. I do wish there were more words in one way: this little book, Hear Me Now, is too short. I enjoyed it and I wanted it to keep going. It hooked me right from the start; the first two poems, “Ashes” and “Dancing with Raindrops,” are on facing pages, and show two opposite sides: “Ashes” is about the ugliest side of humanity, our penchant for mindless destruction; and “Dancing with Raindrops” is about the indescribable beauty of short, sudden moments, like bursts of wonder, that come at us sometimes when we’re not expecting them and we need to pay attention, or we miss them. Putting these two against each other heightens the impact of each, as the beauty of nature makes it sadder that men destroy it – but that just means we have to look even harder for the beauty. 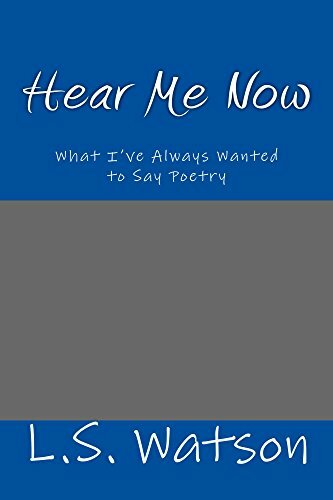 The book is like that: I have read it twice, and I expect to read it more, particularly “To Whom It May Concern,” “A Thought,” “The Fight,” and “America, the Free.” There are also several poems about heartbreak that I could not relate to quite as closely, and three that showed me the impact of loss on the poet, “Freddie,” “Mother and Father” and my favorite of these, “Share a Memory.” But my favorite poem in the book is “Imperfections.” I love the message and I love the last two lines especially. The ending lines are frequently used to maximum impact. Watson’s poems are fairly short, usually one stanza, though that stanza often fills the page and runs over onto the next; the lines are short, often just one or two words. She uses rhyme frequently – which, if there is anything that I didn’t love about this book, it was that; I am less fond of rhyming couplets than Watson – and the short lines and the rhyme force maximum attention onto the specific words used, particularly at the end of the poem, which sometimes – as in “Share a Memory” – falls like a hammer, like a thunderbolt. Or like a dancing raindrop. Suffice it to say, this is a good book of poems; short, like the poems, but strong, like the poems. I recommend it.